Phew, it's been a busy week, friends! Sorry if I've not been around as much, I've crammed in four flights, three cities and a whole lotta queuing into the past seven days. I started in London, flew to Munich and then back to London, then up to Edinburgh and now back to London! I'm looking forward to sharing my snaps from the trips with you next week but first, with only two weekends left until Christmas, I need to start wrapping some presents. I like the idea of creating a wrapping station, where rolls of paper, ribbons and festive embellishments are all within reach, to make the process a little smoother. So, before my friends arrive for a mini pre-Christmas celebration, I have the following plan: Love Actually on the DVD player; mulled wine bubbling on the stove and a comfy chair from which to view my favourite Christmas film while I wrap. What's on your weekend agenda, folks? I think I should just follow your plan and enjoy the ritual of wrapping. My weekend will involve present wrapping and sorting out our bedroom (we have new bedding, curtains and lamps to put in there!). The wrapping station looks a lot more organised than my plastic box! Wrapping was on my schedule for today even BEFORE I read this! Love your blog, sir! Oh this festive season I really enjoy wrapping gifts n decorating very much. I'll be christmas shopping and gift wrapping, but no where nearly as stylish a station! That's the plan! I also need to slow down a bit this weekend, a hot cocoa and careless web browsing is all I need at the moment. Great idea! I think I'll also wrap the presents tonight and getting organized like you suggest, with what I have, probably the end tables in the living room. I'll even watch the same movie, now that you made me think of it :) I may also go see Spielberg's The Adventures of Tintin tomorrow. It already opened in Belgium and now here in Québec since yesterday. They know we're the biggest fans and it's a big part of our childhood, so we get to see it first, guinea pigs I guess haha! Ooh you have been busy! Cant wait to catch up tomorrow! I seem to recall that the Spelling family - of TV producer Aaron Spelling has wrapping rooms in their house. 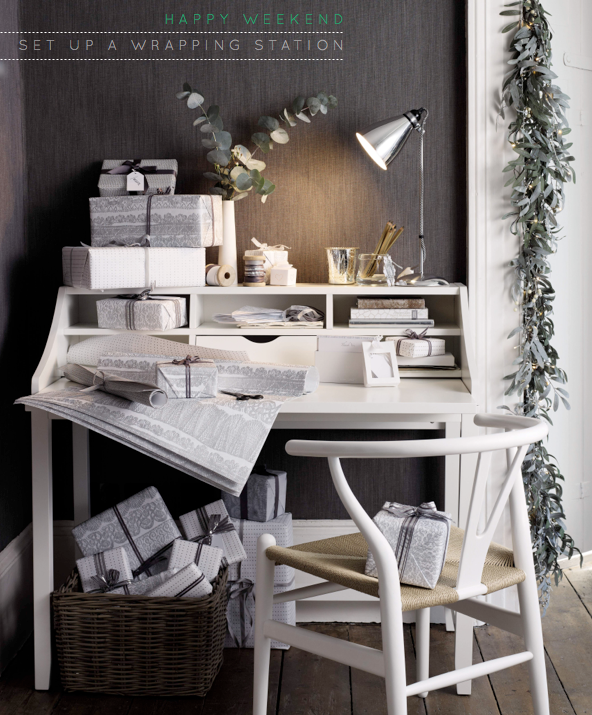 Can you image having a dedicated gift wrapping room? That would be the "mostest" wrapping station ever. Thank you for leaving a comment - each one makes my day!